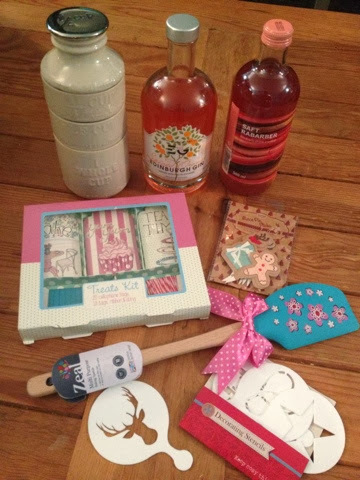 I must have been an exceedingly good girl in 2013 as Santa (and others) gave me some fantastic gifts. As always they were pretty foodie heavy. First up is the very last one that I opened. A special gift from Foodie Loon. I do hope that the lovely John Webber knows what he is letting himself in for. 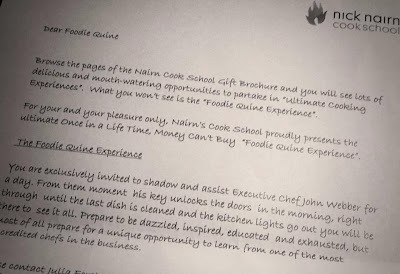 If a warts an all experience at Nick Nairn Cookschool wasn't enough I'm also going to be time travelling to a Prehistoric Cookery Weekend with Wild Rose Escapes. One child place comes free with every adult so boy will be joining me although he doesn't know it yet. When he finds out I suspect he may be even more excited than me. We're both booked in for the end of May. So many other lovely goodies from friends and family who know me so well. Apparently I am very easy to buy for. 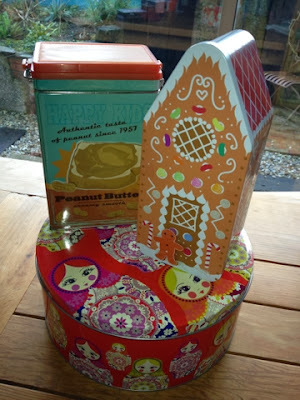 A gorgeous selection of tins reflect my love of Peanut Butter, Gingerbread Men and Russian Dolls. There has to be books at Christmas and I was lucky enough to receive Mary Berry's Autobiography (which has already been read - great book), The Stornoway Black Pudding Bible and a NTS Wild Food Guide. 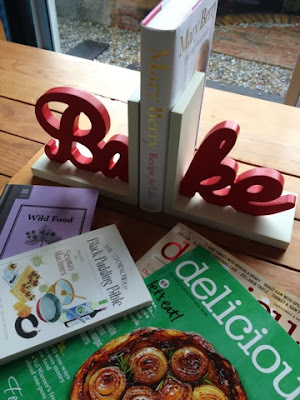 I've a years subscription to Delicious magazine to enjoy throughout 2014 and a fab set of Bake bookends to keep everything in order. There's always something cheesy among my gifts and it turns out that my Mum and BFF had both been shopping at the same place but thankfully for slightly different personalised items. 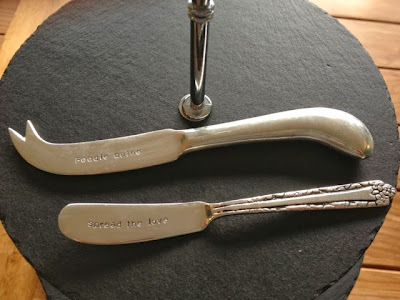 A Foodie Quine cheese knife and a Spread The Love butter knife. Love these so much. My sister got me a gorgeous three tiered slate cake stand. 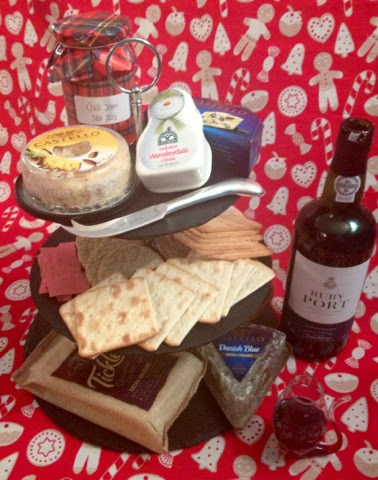 Perfect for the elusive cheese afternoon tea. It was put to very good use over Christmas. I spotted the Milk Bottle Measuring Cups a couple of months ago and absolutely loved them so I'm very pleased that someone was paying attention. I was somewhat skeptical about Spiced Orange Edinburgh Gin when it was launched even although I love both their Raspberry and Elderflower flavours. But I've been won over and its fab to now have the whole set. Not sure how Ikea's Rhubarb cordial will compare to my own Rhubarb Vodka. Some of my gifts have already been eaten or are in use so haven't made it into the photos. A Squirrel Stash Collection from Hotel Chocolat certainly didn't last long. The Mince Pie Picks have been stowed away for next year and I'm looking forward to using my Treat Kit to package up my goodies for the next Gourmet Gals Food Swap. Ohh wow! Very lucky!! So many lovely things! Great round up, lucky you! Hope your boy doesn't read your blog! 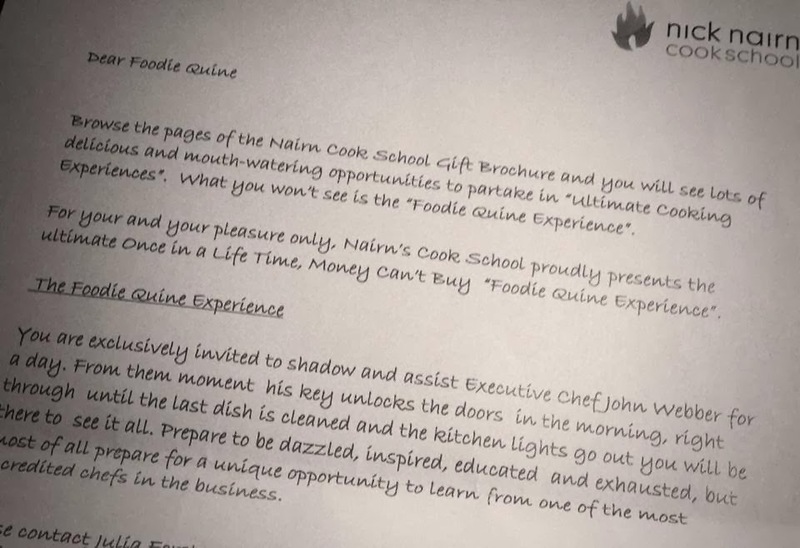 *spoilers* The course and the Foodie Quine Experience sound fantastic! Look forward to reading all about them! 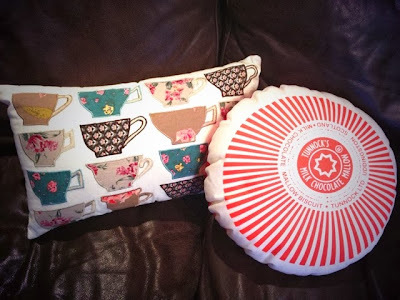 I got my Sister a Tunnocks Teacake cushion for her birthday last year. The lady who makes them also does Caramel Wafer cushions. They ain't cheap neither. Somebody loves you!